The high-speed railroad project between Riga and Moscow must be self-sufficient and should not require additional funding from the state, Transport Minister Uldis Augulis (Union of Greens and Farmers) announced during the 14th international conference "TransBaltica 2011" today. 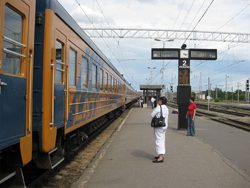 Augulis explained that the state-owned railroad company Latvijas Dzelzcels (LDz) is currently discussing financial opportunities and means for implementing the project with the Russian railroad, and emphasized that the Riga-Moscow project will not compete with "Rail Baltica", informs LETA. The Riga-Moscow project is not only a Latvian-Russian project, but also a project between the European Union and Russia, and therefore it is also important for Latvia. Augulis emphasized that Latvia has the most experience in the Baltic region in organizing transportation of containers by rail. Container train Baltika-Tranzits"transports cargo from the Baltic States to Central Asia and back, Rigas ekspresis transports passengers on the route Riga-Moscow, while the container train "Zuber" runs on the route – Latvia-Belarus-Ukraine. The U.S. decision to use Latvian transport infrastructure for transit on non-military cargo to Afghanistan also reflects the professionalism of Latvian transit companies. The minister pointed out that due to Latvia's advantageous geographic location, the country can ensure the most effective distribution of goods in the Baltic region.